I’ve now crossed into tropical Costa Rica. Tucked in between Nicaragua, Panama, the Pacific and the Caribbean, it’s country famed as much for the richness in its ecological biodiverstity as that of its US retirees, who have migrated south to scoop up vast swathes of its prime, and sublime, Pacific coastline. 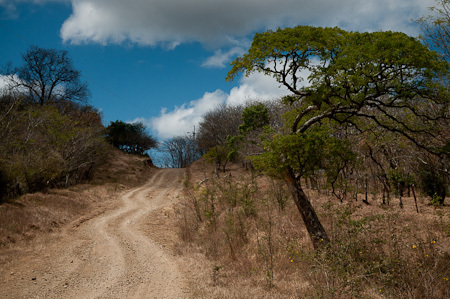 My rough plan is to follow the bone-dry, dusty dirt tracks that interlink the Pacific beaches of its famed Nicoya Peninsula, before cutting back across the Continental Divide to the Caribbean coast at Limon, and on into Panama. 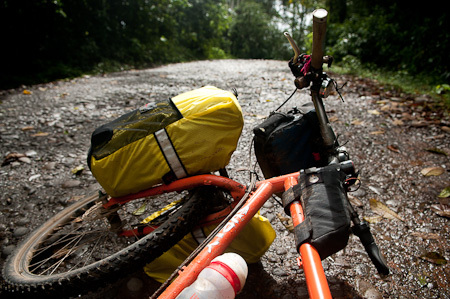 As ever, I’ve been keen to avoid all cycling interaction with the infamous Pan American highway. So far I’ve only ridden it for a handful of uninspiring kilometres, which has proved to be a good route recipe to follow. 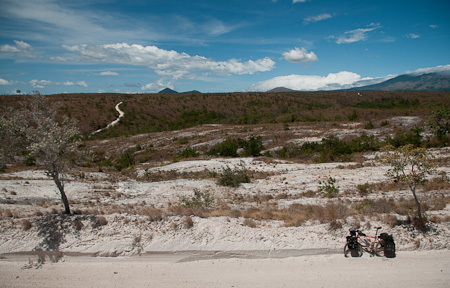 In figuring out a way round it on this occasion, I’ve just ridden one of the most beautiful and varied stretches of terrain I’ve had the pleasure of experiencing in Central America. Even though the weather wasn’t on my side – permadrizzle and heavy downpours obscured any volcano views until the last day – it’s a ride I’d highly recommend, come rain or shine. 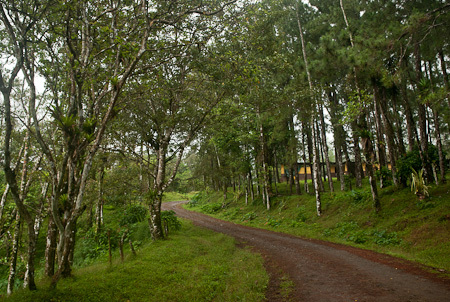 It’s also a journey that perfectly encapsulates how Costa Rica’s crumpled cordillera effectively splits the country into two distinct weather systems and accompanying ecology: lush, green and shiny wet vegetation on the Caribbean side, and dusty, scorchingly hot, bone dry expanses on that of the Pacific. 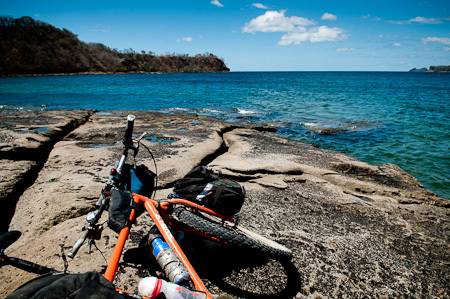 Most riders head straight down the Panamerican from La Cruz, just over the Nicaraguan border, to Liberia, the jumping off point for the Nicoya Peninsula. 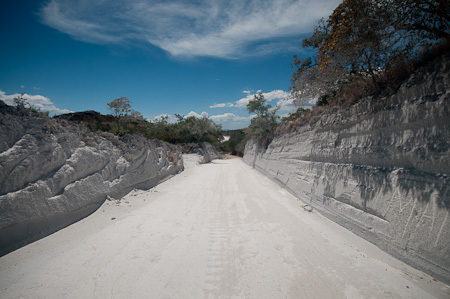 Heeding advice, I decided to drop down into the often overlooked Bahia de Salinas, before dog-legging briefly along the highway to loop up and around Volcan Rincon de la Vieja National Park. 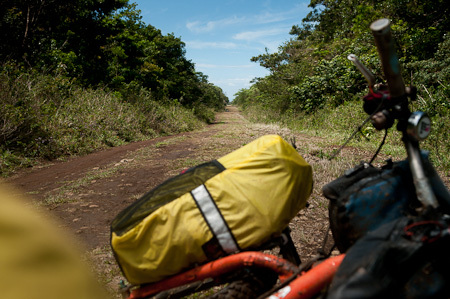 The ride trebles the distance between the two towns, interlinking the tiny communities of Puerto Soley, Cuanjiquil, Brasilia, Dos Rios, La Libertad and Colonia Blanca, culminating in a massive descent into Liberia. But it definitely makes up for the extra mileage, earning itself a place in the upper echelons of my Hall of Fame rides. 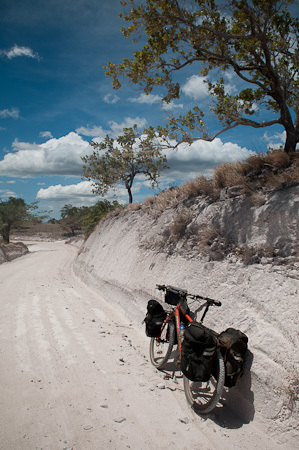 Thanks to Barry for encouraging me to explore the Bahia Salinas and Volvan Rincon de la Vieja, and to Ciclo Guilly for suggesting the amazing unpaved route from Brasilia to Liberia, unmarked on my National Geographic map and on Googlemaps. 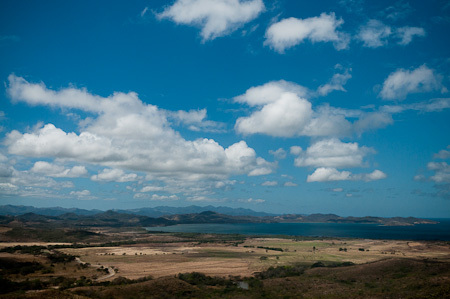 If you stick to the Panamerican Highway, you'd ride straight past this epic view over the Bahias de Salinas, and the distant Peninsula de Santa Elena - just a few minutes away from the main road at La Cruz. Make that detour! 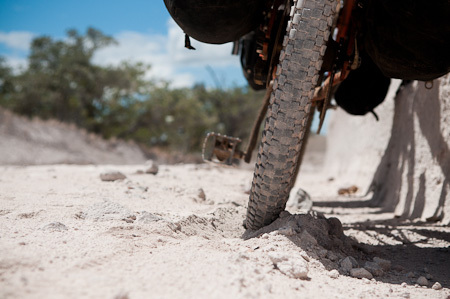 A fast paved descent peters down to a meandering track, with all manner of beachy side trips. 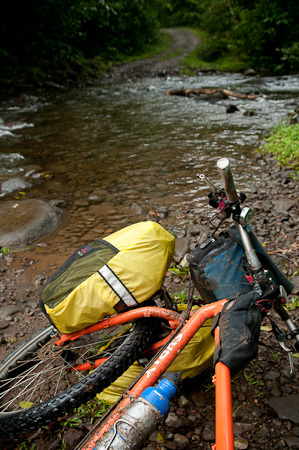 This was mountain bike touring heaven. Like this one, at la Playa de la Isla. A perfect spot for a picnic. The climb back out to the main road however, in the midday heat, was intense. 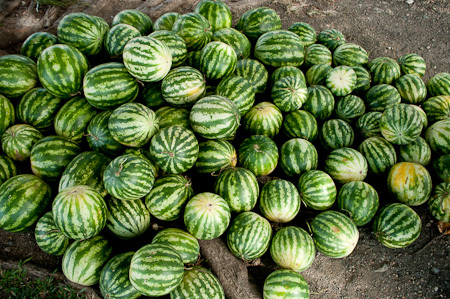 Luckily a Tico selling juicy watermelons had set up shop at the junction; I guzzled down a whole one in a few minutes, slabbering like an overheated dog. 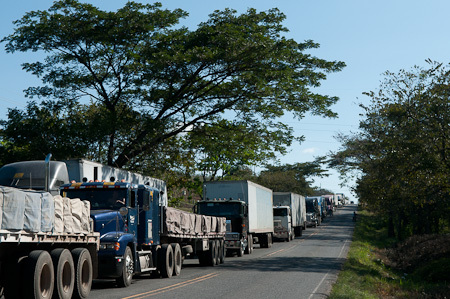 Why to avoid the Panamerican Highway... Luckily, I only had to experience this for a short stretch, turning off just south of La Cruz onto the road to Upala. 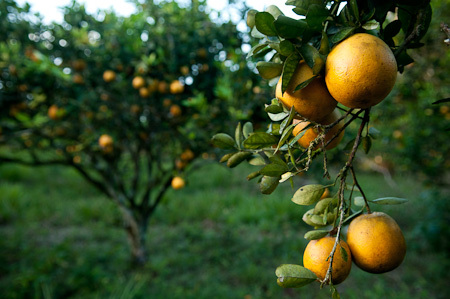 This area is home to enormous fruit fincas, and that night I made my home in an orange grove. A vitamin C start to the following day ensued. 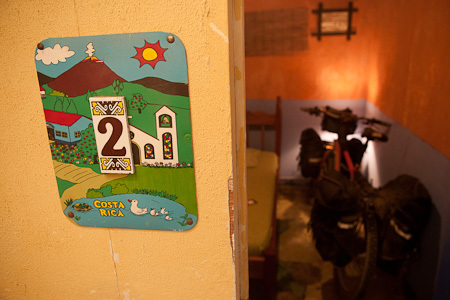 Costa Rica is expensive, but away from tourist hotspots, you can still have yourself a cheap cycling breakfast. 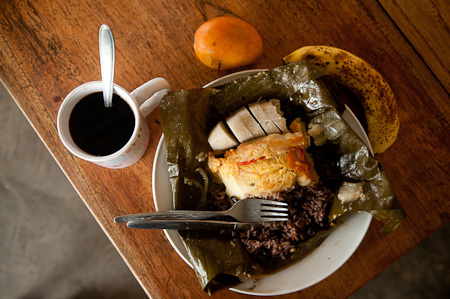 What you see here - gallo pinto, a tomales, plantane, fruit and a mug of coffee - set me back just over 3 dollars. The tropical sun had been beating down with all its might over the last few days. But the forecast ahead wasn't so promising. 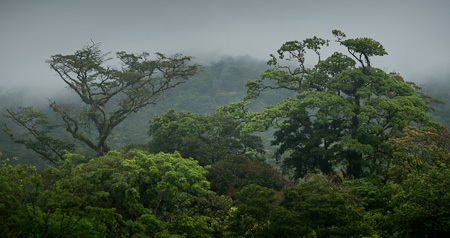 The fine mist and bouts of heavy drizzle that descended across the land shrouded any volcano views I had hoped for. 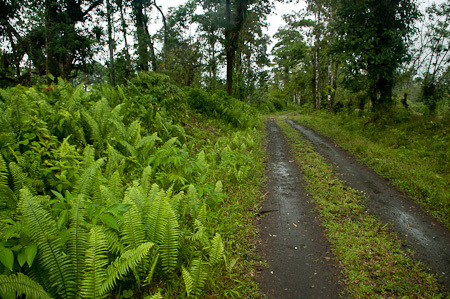 Still, despite the rain, the stoney track I followed past waterlogged Brasialia was sublime. It was almost completely traffic free, and set in a tunnel of lush green vegetation, leading me into the Cordillera de Guacanaste. At times, it was as narrow as an English country lane. Even the fact that it was, by now, pouring much of the time hardly tempered my enjoyment. This was incredible riding. 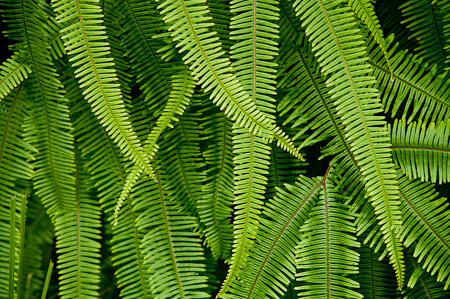 Overlapping, neon green ferns drooping over into the trail. And intricate, teardrop shapes awaiting to take their place. The track passed beautiful, mystical forest glades; gorgeous camping potential. 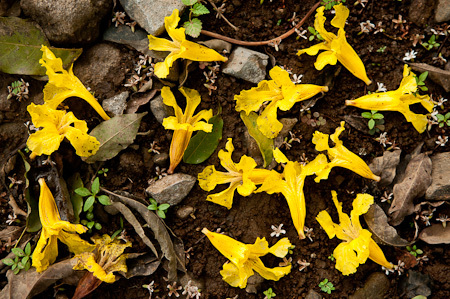 Past fallen flowers by the roadside, yellow guayacan, just one layer in the incredible textures all around. in fact, the field on the other side of a wonky barbed wire fence had become a simple burst of yellow. It was still pouring by the time I made it to Colonia Blanca. My tent was soaked from the night before, so I treated myself to a room for the night. Not too bad for $10. 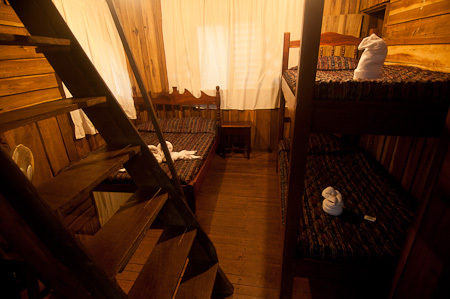 A bathroom and five beds all to myself. 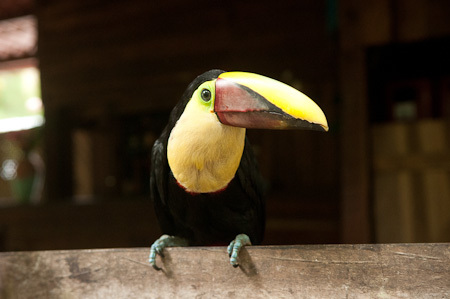 The pet toucan. With such a ridiculously long beak, this huy had to look at me sideways with just one eye, hopping along the gate as I moved up and down. 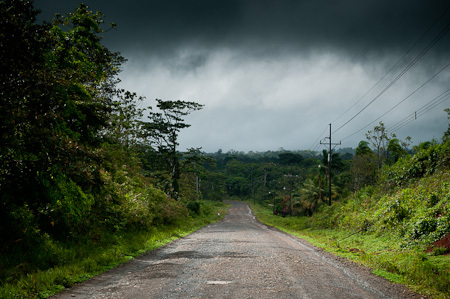 From Colonia Blanca, the track began to ascend, skirting further round the volcano Rincon de la Vieja, still shrouded in mist, and crossing various slippery bridges. Crystal clear. Good spots for a refreshing cool off. Up and up, past cattle ranches. Not a car in sight. Fording streams, knee high in places. Past enormous, jungly vegetation, seemingly overfed by this abundance of water. Electric blue morpho butterflies flitted across my path, and the odd howler monkey stretched his vocal chords from the treetops. I was entranced by this place. 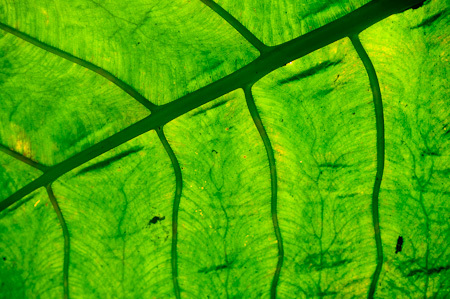 Veiny leaf detail - sunshine at last! Until it finally crested out onto a ridge, opening out into a long, wide and bizarrely water-free track, a world away from the lush green foliage and stream crossings I'd just experienced. As I looked back over my shoulder, dark storm clouds still loomed, yet here, I was bathed in sunshine. 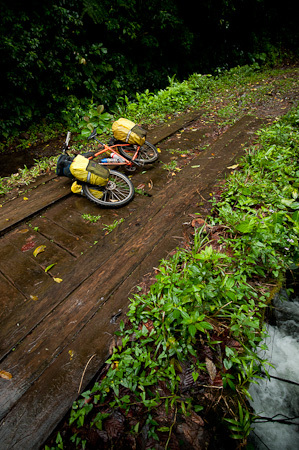 In a matter of kilometres, I had crossed back into the Pacific half of Costa Rica. 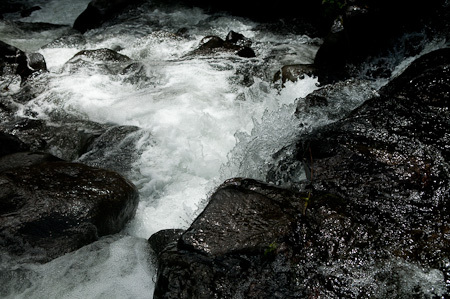 A dirt road, mined with rocks and gullies, began to plummet down the mountain side. 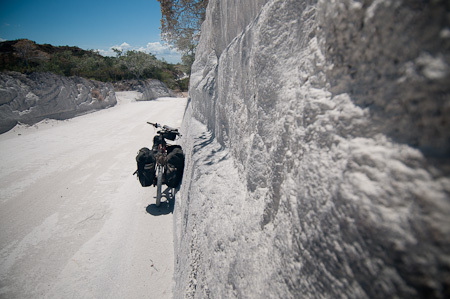 Until this morphed once more into an almost blindingly white, powdery track chiselled into the mountainside. Several metres high in places, it funnelled me ever downwards, as I fishtailed through thick patches of sand and drifted round bends, loving every moment of it. Soon, everything was covered in a fine, powdery film. 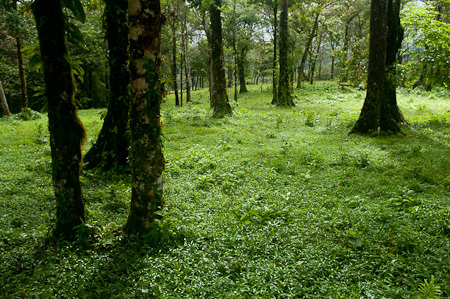 The change was dramatic and stark, a complete opposite from the green, lush vegetation I'd set out from that morning. It was hard to believe that an hour before, I'd been soaked to the bone in jungle humidity and sudden downpours. Now my sweaty brow was sticky with dust. Finally, I could enjoy those epic volcano views, almost completely clear on this side of the national park. The descent wound on for some 20 kilometres; marred only by the incongruously placed rubbish tip a few clicks from the bottom, which was releasing an assortment of colourful plastic bags into the tree branches all around. I'll take blossoming flowers, thanks. In Liberian, I hit the bakery to catch up on some calories, then found some characterful digs in the form of la Posada de Tope to lay my head for the night. Hey Cass…loving the flowers and leaves. 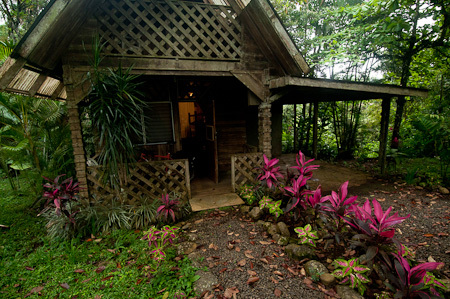 Costa Rica looks amazing. It reminds me a bit of some parts of Ecuador. 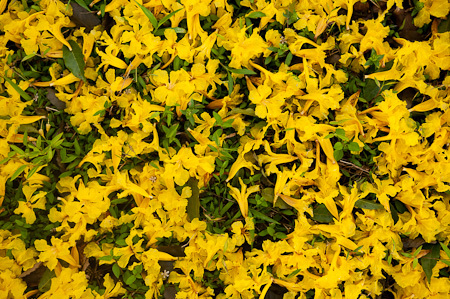 Can I make a special request for a couple of orchid shots…there must be lots in the rainforest and cloud forest. 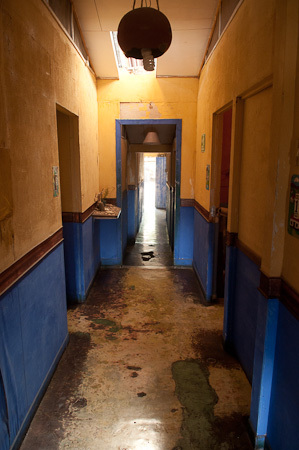 great blog and fantastic photos. aahhh almost felt like I was there – arm chair travel has never better! Keep pushing those pedals! 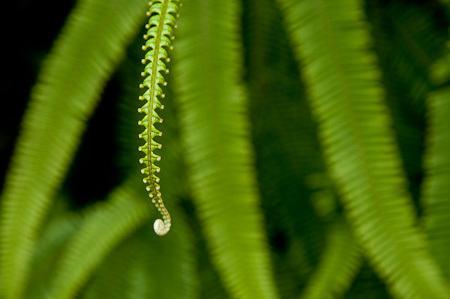 Stunning photos, you’ve just put Costa Rica on my list of places I really have to go. Beautiful stuff Cass, hoping to cheer those of us stuck in the UK up a bit. I’ve just read this and thought you might like it, I seem to remember you wanted to do the Iditabike some time..
Andrew (Liddle) – and thank you for the oil. It has been put to good use. Hope the knee is doing better… Where are you now?? Hey Cass, my copy of Adventure Cyclist just arrived – very nice article in it by Cara. Good pics, but its a shame I think that their layout doesn’t make the best of your shots. Great, glad you enjoyed it. Unfortunately, I don’t get any say in what pics get used, or the layout. Normally they do a good job, though inevitably different pictures are always used than I expect. I guess it depends too on what else is in the mag, in terms of balance. Another amazing bit of riding and fantastic pics as ever. Really enjoying the pics of vernacular houses (I have a house obsession like your mural one!) and the way the road changes in this story…! Glad you enjoyed it Nick – definitely one of my favourite parts of Costa Rica. The beach riding round the Nicoya is fun too. Cheers for the inspiration. 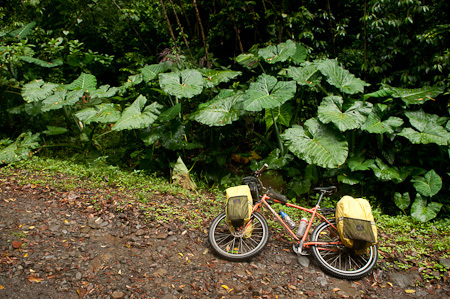 I’m putting together the final details for a tour between alajuela, CR and grenada, nicaragua, and will be riding through the rincon de la vieja before descending into liberia. 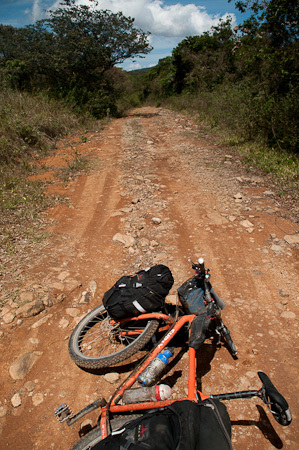 At this point i’m struggling to find a good off-pavement route between liberia and the salinas bay area. I’d rather not take the obvious panamerican route, any trail beta for me? Only have what I’ve written up in the posts… This was all pre my route planning Google Earth. Reckon that’s the best place to go check!